Ageing transactions can be entered into your livestock tracker from the main screen of the production tracker. An ageing out transaction is first created for the immature stock class, on selecting the mature stock class Figured will automatically create the ageing in transaction. This means if you wish to edit an ageing transaction, you will always edit the ageing outtransaction. 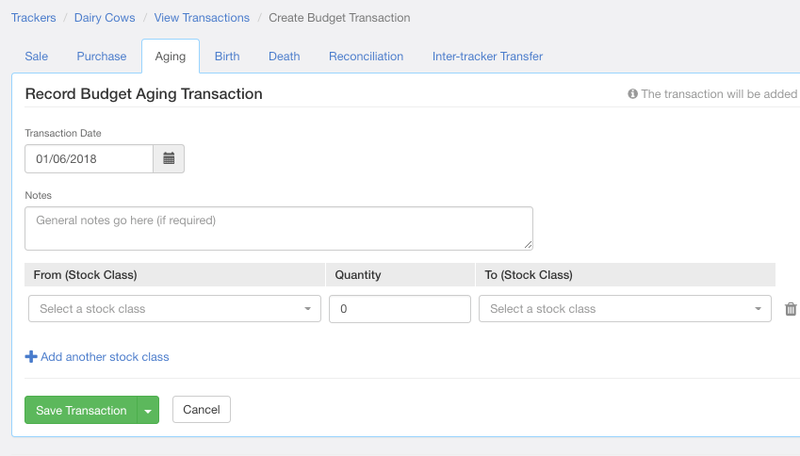 The option to enter an ageing transaction can be found under Add Transaction, either as an actual, budget, or forecast. To record ageing, you'll need a date, a from stock class (immature), a to stock class (mature), and a quantity. Notes or a description can be added if you wish.